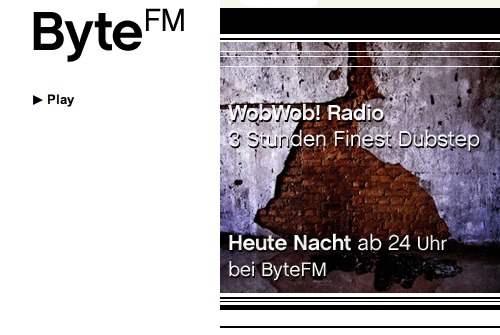 Byte FM is the station. WobWob! is the show. Finest Dubstep is the music. Nothing more to say. Tune. In. Now (= 22nd of April, 11:50 pm). Edit: Actually itÂ´s not dubstep but some bloody nice roots reggae which is playing now. That might change later on though.